My Aunt was known as the African Violet lady... and no wonder. Her entire living room was crammed with plantstands festooned with madly blooming African Violets. The room was filled with the delicious peaty scent of damp earth and a soothing swath of pink, blue and purple blooms. My Aunt's obsession was not unique; many people let their affections for Saintpaulia run riot, especially, I've observed, plant-loving people who live in colder climates. My theory is that people drawn to Saintpaulia's furry soft leaves and dainty blooms quickly discover that the African Violet is one of those rare house plants that really is easy to look after, and one that will bloom continuously through all those long dark months if given what it needs. New African Violet caregivers, addled by years of trying to nurse fussier houseplants along, suddenly find themselves successfully nurturing a houseplant that actually rewards their devotion... and buy or propagate just a few more... and a few more. . . and voila! Another Saintpaulia obsession has bloomed! One reason the African Violet is such an ideal houseplant is that it likes the same temperatures as people do. I keep my house about 20 degrees C. during the day and lower the temperature to about 15 degrees C. at night and the Saintpaulia are thriving. African Violets will tolerate day temperatures up to about 85 degrees F, but like cooler temperatures at night. Sixty-five degrees F. is ideal. According to the University of Nebraska's Nebguide on African Violets, however, the plants will become stunted at temperatures lower than this and will be slow to recover even when put into a warm place. These plants are also easygoing houseguests because they don't need direct sunlight. They do need good light, but hot, direct sunlight can scorch them and cause unsightly leave blemishes. My aunt always said that an East-facing windowsill was best. In African Violets, H. C. Jones and C. A. Conover state that African Violets need about 1000 foot-candles of light for 8 to 12 hours per day for best growth and flowering, and explain how to tell from the appearance of the plants whether or not the light level is satisfactory. If the light is too low, the leaves are usually deeper in color and thinner than leaves on plants receiving higher levels of diffused light. The plants may grow well but will flower poorly or not at all. If the plants are getting too much light, the leaves become pale or yellowish green, are much lighter than normal, and some leaves may show dark areas where they have been shaded by other leaves. Growth at high light levels is slowed and although flowering may continue freely for a while it will eventually decrease due to chlorophyll destruction. You can test the intensity of the light your African Violets are receiving by putting your hand between the plant and the window, with the back of your hand toward the light. The light should be bright enough to cast a shadow but not so bright as to feel hot on the back of your hand. If the light levels are insufficient, you may want to invest in artificial lighting. The fastest way to kill African Violets is to overwater them. For this reason, watering them on a fixed schedule, such as every Saturday, is a bad idea. Instead, feel the soil around your plants, and water if the top is dry. You want to avoid getting the leaves wet when you water (which will also cause unsightly blemishes), so the best way to water is from the bottom. When the time is right, I just fill the saucers beneath my African Violet pots. Once the plant has absorbed the water, (sometimes in seconds), I refill the saucer. Be sure to use tepid water rather than cold as the plants don't like water that is too hot or too cold. If you've just bought an African Violet, you may want to repot it as soon as possible. The African Violet Society of America warns that the potting mix most commercially sold violets are grown in, which consists primarily of peat moss, can easily drown your plant in water. These prepared mixes have been sprayed with a chemical that causes the peat moss to absorb water, and then release it slowly to the plant. The problem is that the chemical only lasts three to six months, and once it loses its effectiveness the peat moss will tend to either hold too much water or none at all. So if you don't want to lose your African Violet after six months, repot it to save it from drowning. African Violets, like many houseplants, need to be fertilized regularly; in fact, if you're using a soilless potting mix, you should feed them every time you water them. You can buy special African Violet fertilizer or follow the recommendation of the African Violet Society of America and use a 20-20-20 fertilizer at half the suggested dosage. The Society also recommends letting the bottle of fertilizer you've mixed stand at least overnight to let the chlorine in the water evaporate, and bring the water to room temperature, a handy tip as African Violets do not like chlorine either. Whether potting your new African Violet guests or repotting your old friends, the first consideration is the preparation of the potting medium as drainage is critical. If you're using soil, a mixture composed of about two parts fertile loam, one part leaf mold or peat, and one part sand or perlite is ideal according to Donald H. Steinegger, Extension Horticulturist for the University of Nebraska. The African Violet Society of America recommends using a mix of 1/3 peat moss, 1/3 vermiculite and 1/3 perlite. You can also buy pre-packaged African Violet soil mixes. The second consideration is the size of the pot you're going to use, as Saintpaulia must be potbound to bloom. Choose a pot that is 1/3 the diameter of the plant. A pot of the proper size also helps prevent root rot. To keep your African Violets healthy, they need to be repotted every six months or so. (I repot mine once a year and they don't seem to mind the delay.) This gives the plants new nutrients through having fresh soil, and helps get rid of fertilizer salts that may have built up. If one of your African Violets has developed a neck, a bare place where the leaves have been taken off, you should repot it as soon as possible so the neck is covered with soil and can grow new roots. Propagation is often the downfall of African Violet collectors; it's so easy they end up with a roomful of plants before they know it. The most common method of propagation is by leaf cutting in spring. Any healthy, firm leaf will do. Remove the entire leaf with petiole (leaf stem) by snapping or cutting it off at the stem of the plant and trim the petiole to about 1 to 1 1/2 inches in length. Then make a hole in the growing medium (such as a half sand, half vermiculite mix) with a pencil, insert the leaf stem into the hole, and water thoroughly. According to Jones and Conover, roots normally appear at the petiole base in 3 to 4 weeks under good conditions and leaves of the new plants appear at the medium surface 3 to 4 weeks after root formation. In two to six months, young plants start from the bases of the stalks, which you'll be able to repot once they've formed two to three leaves. African Violets may also be propagated by division. Simply cut each crown away from the plant carefully so that each plant has its portion of the root system, and plant each division in whatever African Violet potting mix you're using. There are thousands of varieties of Saintpaulia, and a huge variety of flower shapes and colours. I'm very partial to the muticolor varieties, such as "Fancy Pants", which has single, frilled red and white flowers, but there are African Violets for every taste. You can even get micro-miniature plants that will fit in a wine glass, such as "Pip Squeek" which has single pink bell-shaped flowers. 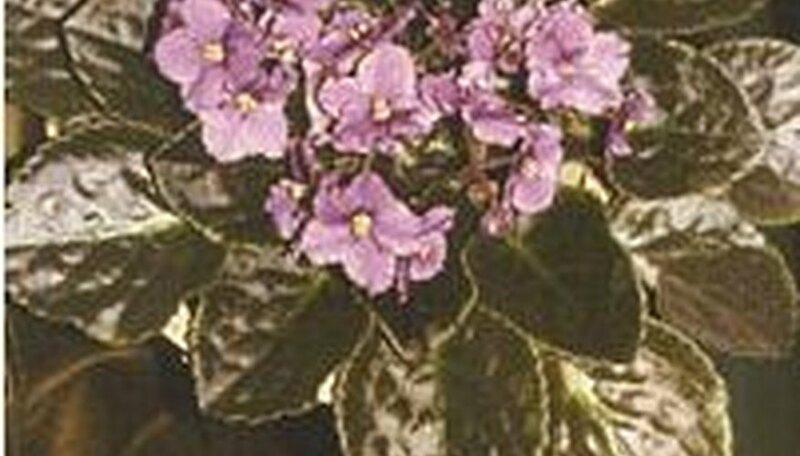 There's an excellent picture chart of the different varieties of African Violets in The House Plant Expert by Dr. D.G. Hessayon. If your African Violets turn sick or unhappy, you'll probably want to visit the home site of the African Violet Society of America. They have a very useful FAQ organized by topic that covers any problem you may encounter. Generally, though, African Violets are one of the easiest plants to share space with in your home. As long as you follow the rules and give them what they need, they'll provide you with colorful, cheerful companionship for years to come. Susan Ward is an ex-English Teacher who now earns her living by writing. She is author of the column "Gardening in B.C." at Suite 101.